We’ve all heard over the last few years reports in the news that bee populations are declining. As this could have an impact on future food production around the world there are many studies attempting to find out the reason for the decline. One of these studies is taking place at The Royal Botanic Gardens, Kew. Working in collaboration with Tumbling Dice, a software company based in Newcastle Upon Tyne, they have developed a miniaturised microchip tagging device that attaches to the back of a bee enabling researchers to track its activity when within a 1.2 diameter range of a detector unit. To attach the chip the bees were chilled for around 10 minutes to make them docile and then using standard superglue the tags were fixed in place. 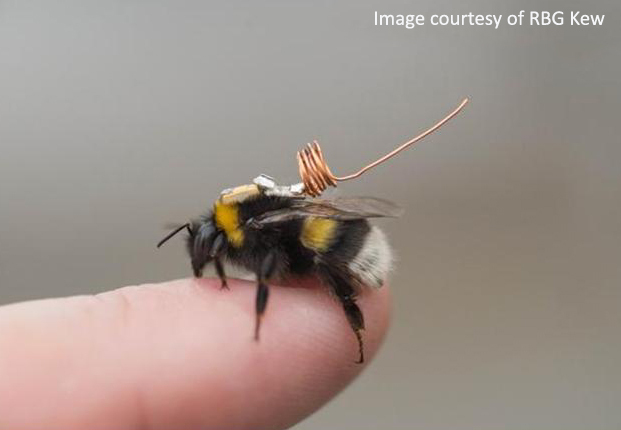 This new technology is being trialed in Kew’s Quarantine House and it is hoped that in the future it could be used in the wild to help scientists unlock the secrets of how bees live and work and in turn, find out why their numbers are dwindling. Read more about the work RBG Kew are doing with bees. Updated 2018 – The technology in this article has moved on and I’ve seen recent news that a similar tracking device is being used in Brazil and Australia to monitor bee movement. I’ll post further details when I have more facts.